Amid intense calls from progressives for a primary opponent for U.S. Sen. Dianne Feinstein, D-Calif., state Senate Pro Tem Kevin de León confirmed Sunday he will mount a challenge against the longtime incumbent, setting up a rare fight among Democrats for a seat in the upper chamber. The 50-year-old Democrat has long been rumored to be eyeing the seat, as he’s termed out of the state Senate next year. And while few expected him to launch a bid unless Feinstein, 84, decided to retire, calls have been intensifying for a challenge from the left, as Feinstein’s image as a moderate Democrat willing to reach across the aisle is now viewed by many progressives as falling short of the strategy needed to defeat the Trump agenda. For example, the California senator faced fire this summer after making comments about the president that were seen as too tepid by an audience eager to hear fierce rhetoric on how to defeat Republicans in Washington. After the backlash, she walked back the remarks. Feinstein’s perceived strengths – bipartisanship, civility and Washington experience – are now seen as weaknesses in a state that has positioned itself at the center of the so-called “resistance” against President Trump. The contrast between the two is striking. De León, raised by an immigrant mother in Los Angeles is looking to climb the political ladder. He’s the first Latino to be Senate president pro tem in over a century and has embraced the role of being against all things Trump. “Do I support impeaching Donald Trump? Well. Let me see. The answer is yes,” he told The New York Times. Meanwhile, Feinstein is a fixture of the establishment with her roots in the Bay Area. She’s also one of the wealthiest members of Congress, and has found herself aligned with the GOP on issues like national security and privacy. “On the big issues of our time, she’s been on the wrong side of history,” said progressive Rep. Ro Khanna ,D-Fremont, last week on SiriusXM’s “The Dean Obeidallah Show,” referencing Feinstein’s image as a “war hawk” for her vote for the Iraq war and support for the Patriot Act. While the announcement is grabbing early headlines, de León faces an uphill fight. Feinstein has the backing of the Democratic Senatorial Campaign Committee, major party leaders like U.S. Sen. Kamala Harris, D-Calif., and enjoys almost universal name recognition. Furthermore, she has a robust fundraising apparatus, enjoying a strong donor base across the state – something that de León lacks. 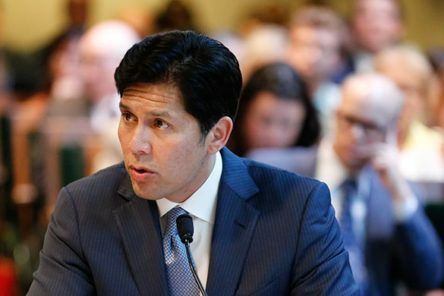 Meanwhile, the race is also bringing more focus onto the state’s jungle primary system, with it being possible that de León and Feinstein face off in the primary and the general, leaving out a Republican voice in the overwhelmingly liberal state. But still, Republicans are welcoming the intra-party conflict, seeing the race as one that can push the party even further to the left and divert resources away from congressional races in the state. The primary fight comes at a time of soul-searching for Democrats nationally. Reflecting on the failures of 2016, many left-wing activists see a need to push back against the old guard, in hopes that a new crop of talent could re-energize the base and lead to more victories in 2018 and 2020.